Editor's note: This is a guest post by Greg Muender, co-founder of Whttl and a former driver for both Uber and Lyft. The post went through PandoDaily’s usual editorial process and Mr Muender was paid for his work. From April 2013 until November 2014, I was in between startups and wanted to fill my time with something fun. As a new resident to San Francisco, I figured that ridesharing could be an opportunity to meet people and explore the city. I started driving with Lyft, and then eventually gave UberX a try when I moved back to San Diego. I no longer spend my time as a wheelman since I am occupied as the cofounder of Whttl, where I’m tasked with evaluating and comparing startups for our smart directory. As such, I figure I have a solid foundation to compare the two ridesharing juggernauts. It’s truly fascinating how different they in fact are. Both have received a ton of press attention as of late, especially Uber, but I hadn’t yet seen a driver or employee share their insight. Nor had I seen a reputable source compare the subjective and nuanced differences between the two. So, I figured it was about time I chimed in. During this reading, I’ll do my absolute best to remain as unbiased as possible. However, I must disclose that some inherent favoritism may come into play. Discount it as you like. I will simply present the facts, provide a little bit of interpretation, and let you, the reader, decide for yourself what you take away from it. In the end, I aim to create a platform for dissecting the two beasts from within. Let’s set the framework by reaffirming the respective taglines of the companies. Lyft: “Your Friend With a Car” There is one single differentiator that is most significant, and it reverberates through the whole organization, from the top to the bottom. I’ll get to what that is in a bit, and how it connects with these taglines. First, let’s look at some specific points of differentiation. Below is a notice that Uber sent me because my driver rating had evidently fallen below their minimum threshold of 4.55. This notice was noteworthy for two reasons. First, it came across as quite harsh. There was nothing like, “Hey, we value you as a driver, but just FYI, here’s how we think you could improve.” The writer just dove head first into how I screwed up. Second, it was inaccurate. Uber would later send a short follow up email that stated I was sent this email in “error.” My rating has never fallen below a 4.9, so they surely were mistaken. With Lyft, there was one passenger incident (out of the 1,200 rides I have given so far) that required Lyft to reach out to me via email. When I replied back, here was their response. When I reached the 1,000 ride milestone with Lyft, they sent me a party pack to celebrate. I was pleasantly surprised and felt valued for the work I had done and the contribution I made. 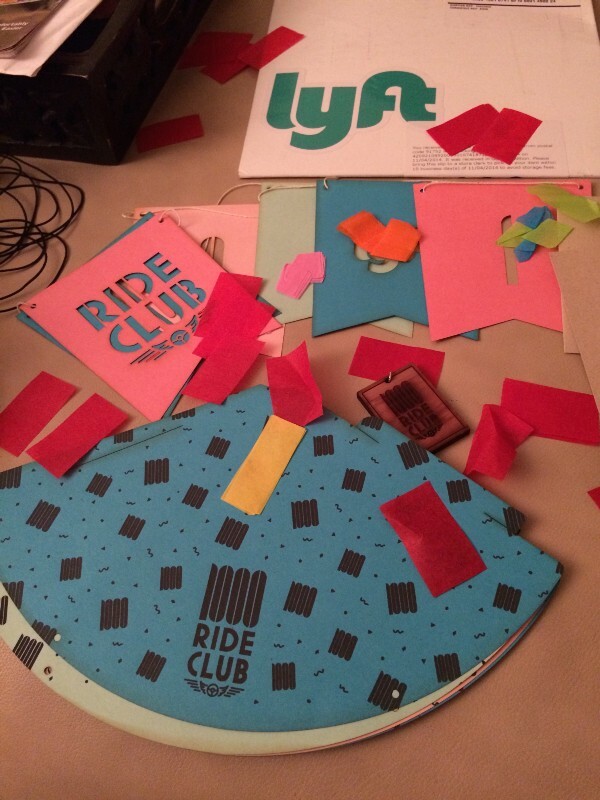 It may have only cost Lyft a few bucks to create and send, but it had a major impact. Granted, I never drove anywhere near 1,000 rides with UberX. Even so, I felt that my work was not inherently valued. 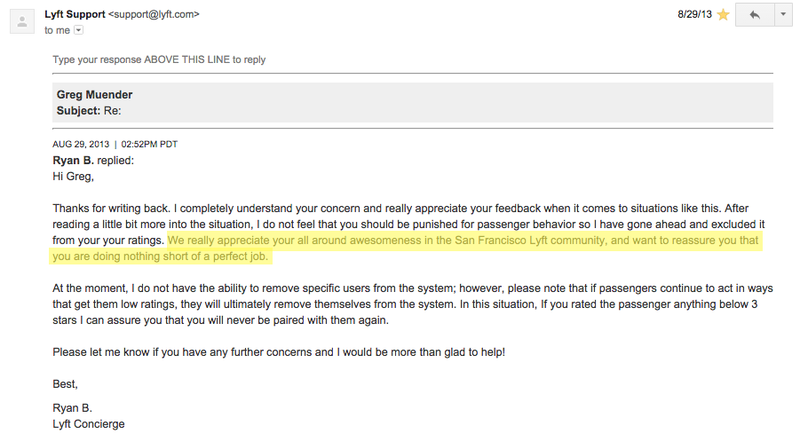 I can’t recall any communication that suggested, implied, or implicitly stated their appreciation for me as a driver. Uber is known for their black cars and SUVs. Of course, paying top dollar for a ride around town, one would presume that the driver would be professional, dressed nicely, and greet the passenger with an open door. This professionalism trickles down to their UberX product, too. In one email sent to me, the company recommends that drivers “wear a collared shirt and generally look professional”. They also advise that drivers should open the door and put bags in the trunk. Lyft, conversely, encourages uniqueness. Drivers are musicians, artists, and entrepreneurs like myself (among many other paths), and their personalities come through via their clothing and their cars. Drivers create goofy concepts, such as the Disco Lyft, the Karaoke Lyft, and the Chalkboard Lyft. Cars are still clean and safe, but rides are treated as an opportunity for an experience. Delicate Conversations In the coming years, there will be no need for drivers as driverless cars become ubiquitous. I’ve accepted this as fact, and I’m ready and excited for the change. However, many drivers are rightfully worried about the impending elimination of their job. Uber received a lot of flack in May of 2014 when CEO Travis Kalanick stated that drivers would eventually be replaced with driverless cars. “‘Look, this is the way the world is going” is how he dismissed the legitimate concern of the tens of thousands of drivers that built the backbone of Uber. Lyft does not disagree with the inevitably of a driverless system. However, they implemented some tact when making the statement, and refocused the narrative how the social component will still very much exist. The dynamic will just be a bit different. Instead of drivers meeting passengers, driverless cars will allow for strangers sharing a ride to get to know one another. It still isn’t much consolation for drivers, but nonetheless, the approach was materially different than Uber’s. With Lyft, it seems like often I am picking up other Lyft drivers. (Hint: you can tell based on the thumbnail headshot. All drivers have the “green ivy” behind them). I feel like it is more of a community when drivers and passengers are all from the same walk of life and essentially exchanging rides. Drivers such as myself are just as much passengers, and our role only changes based on our given needs at a point in time (income vs. transport). With Uber, I never picked up another driver. I felt like Uber drivers just didn’t use the service as much as Lyft drivers used their own brand. They were there to earn a living, and nothing more (which is totally OK). They weren't members of a community, but rather just one side in a two pronged marketplace. Until recently, Uber required drivers to use a dedicated iPhone to run the Uber app. To me, this was always an indicator of how personal and work lives should be differentiated. Your personal phone is for your personal life, your work phone is for your work life. You are either in work mode, or personal mode. Don’t mix the two. With Lyft, I have always used my own personal phone, because that’s what I would do if I was driving a friend. I've even used it to show inquiring passengers pictures of my baby daughter (safely at a stoplight), and recorded phone numbers from new friends made during the ride. I never felt like I had to partition my work and personal lives. They were all mixed into one four-wheeled bonanza. So what is the difference? Culture. Hands down. The prices of Uber & Lyft are roughly the same. The products are immaterially distinguishable. The services are both similar in scope and offering. However, the culture is as distinct as night and day. Lyft encourages you to be a good friend. Provide a clean car, have fun, and don’t let your pal down. The culture is goofy, fun, unique, and irreverent, just like a true bud. You’re encouraged to be yourself and have fun. Uber wants you to be a chauffeur and to treat the role as a career. It’s run with military precision and professionalism is encouraged from drivers. It’s coverage is more complete, and it’s no doubt the market leader. This is the result of a culture that values ambition over anything else. The cultural differences are phenomenal. One isn’t more right, per se, but I can appreciate the reasons why drivers and passengers have brand loyalty. Who would have thought that two products, who are at their core a commodity offering, could be so dissimilar?